THE “go to” source for all your investing questions! The How to Buy & Sell Foreclosures Guide teaches you everything you’ve always wanted to know about buying, renovating and selling foreclosures. You’ll learn everything from finding just the right property for your needs to saving money on closing fees. This 118 page book is co-written by Craig Laube and Joyce Aponte, well-respected pioneers in the foreclosure industry. The “Guide” promises to answer every question you have and some you may not even have thought of! A must-have for every foreclosure beginner. Order your copy today and get started in foreclosure investing right away! Go Green. 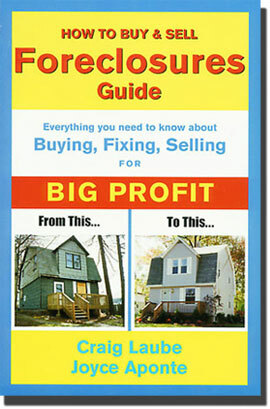 Download your copy of the How to Buy & Sell Foreclosures Guide and help save a tree.